A vehicle’s electrical system is protected from electrical overload damage by fuses. This vehicle has 3 (or 4) fuse panels, one located in the driver’s side panel bolster, others in the engine compartment near the battery. If any of your vehicle’s lights, accessories, or controls do not work, check the appropriate circuit fuse. If a fuse has blown, the element inside the fuse will be melted. If the electrical system does not work, first check the driver’s side fuse panel. Always replace a blown fuse with one of the same rating. Before replacing a blown fuse, move to safe place, turn off the engine and all electric devices, and disconnect the negative battery cable. If the replacement fuse blows, this indicates an electrical problem. Avoid using the system involved and we recommend that you consult an authorized Kia dealer. Four kinds of fuses are used: blade type for lower amperage rating, cartridge type, battery fuse terminal and multi fuse type for higher amperage ratings. Never replace a fuse with anything but another fuse of the same rating. A higher capacity fuse could cause damage and possibly a fire. Never install a wire or aluminum foil instead of the proper fuse - even as a temporary repair. It may cause extensive wiring damage and a possible fire. Do not arbitrarily modify or addon electric wiring of the vehicle. Do not use a screwdriver or any other metal object to remove fuses because it may cause a short circuit and damage the system. The actual fuse/relay panel label may differ from equipped items. 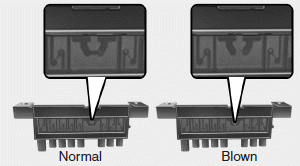 When replacing a blown fuse or relay with a new one, make sure the new fuse or relay fits tightly into the clips. The incomplete fastening fuse or relay may cause the vehicle wiring and electric systems damage and a possible fire. Do not remove fuses, relays and terminals fastened with bolts or nuts. The fuses, relays and terminals may be fastened incompletely, and it may cause a possible fire. If fuses, relays and terminals fastened with bolts or nuts are blown, we recommend that you consult with an authorized Kia dealer. Do not input any other objects except fuses or relays into fuse/relay terminals such as a driver or wiring. It may cause contact failure and system malfunction. Do not plug in screwdrivers or aftermarket wiring into the terminal originally designed for fuse and relays only. The electrical system and wiring of the vehicle interior may be damaged or burned due to contact failure.